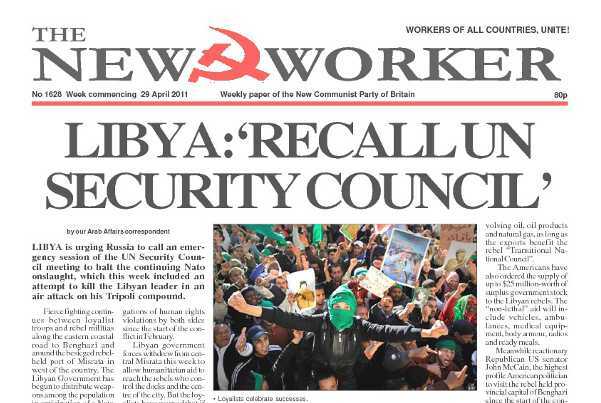 www.newworker.org | 29th April 2011 - Libya: 'recall UN Security Council'. LIBYA is urging Russia to call an emergency session of the UN Security Council meeting to halt the continuing NATO onslaught, which this week included an attempt to kill the Libyan leader in an air attack on his Tripoli compound. WORKERS throughout the world held events on Thursday 26th April to commemorate Workers’ Memorial Day — the day when we remember those who have died through accident of illness caused by the work they have to do to earn a living — and campaign for improved health and safety for the living. ON THE 150th anniversary of the American Civil War there have been a number of articles on this important event in world history. So it’s important to review it as historians and pundits try to falsify history yet again. ANY DOUBTS about the real nature of Guantánamo Bay were dispelled last week with the WikiLeaks release of more than 700 secret US documents that provide intelligence assessments of nearly all those detained when the Americans invaded Afghanistan.